A quick broil and a slow cook of the chicken result in fabulously crispy skin and tender meat. Braising the greens in the chicken’s juices adds savory goodness, too. You can have your butcher debone the chicken, do it yourself, or cook the chicken bone-in. Preheat the broiler. Place the chicken in an ovenproof skillet, season generously with salt, and broil 12 inches from the heat source until the skin is crispy and browned, about 10 minutes. Turn on the oven to 250°F and bake for 25 minutes. Using potholders, transfer the skillet to the stovetop. Immediately transfer the chicken to a plate, leaving the juices in the skillet. Add the shallot and chard to the skillet, stir, cover, and cook over medium heat until the greens are wilted, 4 minutes. 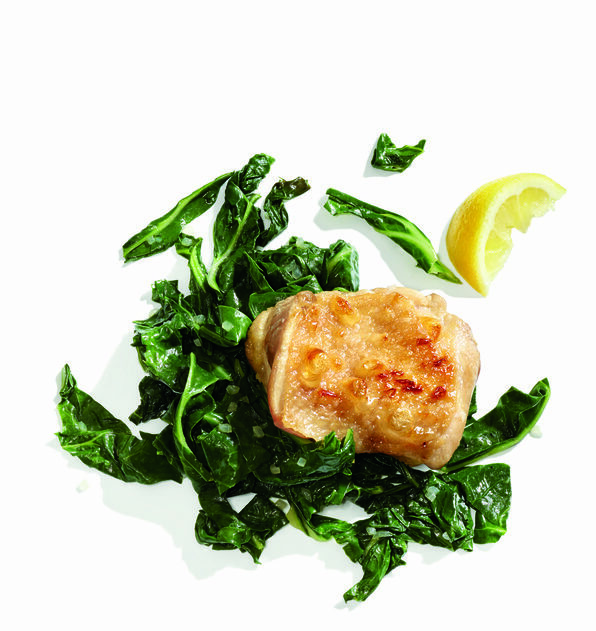 Divide the greens between 2 plates, top each with a chicken thigh, and serve with lemon wedges.